The disease has been recognized for several centuries, and medical historians argue over whether the name "mumps" comes from an old word for "lump" or an old word for "mumble." Cases of mumps may start with a fever of up to 103° Fahrenheit (39.4° Celsius), as well as a headache and loss of appetite. The well-known hallmark of mumps is swelling and pain in the parotid glands, making the child look like a hamster with food in its cheeks. The glands usually become increasingly swollen and painful over a period of 1 to 3 days. The pain gets worse when the child swallows, talks, chews, or drinks acidic juices (like orange juice). Both the left and right parotid glands may be affected, with one side swelling a few days before the other, or only one side may swell. In rare cases, mumps will attack other groups of salivary glands instead of the parotids. If this happens, swelling may be noticed under the tongue, under the jaw, or all the way down to the front of the chest. Mumps can lead to inflammation and swelling of the brain and other organs, although this is not common. Encephalitis (inflammation of the brain) and meningitis (inflammation of the lining of the brain and spinal cord) are both rare complications of mumps. 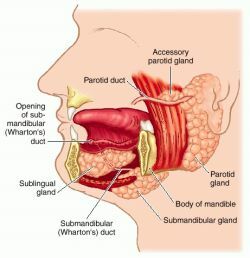 Symptoms appear in the first week after the parotid glands begin to swell and may include: high fever, stiff neck, headache, nausea and vomiting, drowsiness, convulsions, and other signs of brain involvement. Mumps in adolescent and adult males may also result in the development of orchitis, an inflammation of the testicles. Usually one testicle becomes swollen and painful about 7 to 10 days after the parotids swell. This is accompanied by a high fever, shaking chills, headache, nausea, vomiting, and abdominal pain that can sometimes be mistaken for appendicitis if the right testicle is affected. After 3 to 7 days, testicular pain and swelling subside, usually at about the same time that the fever passes. In some cases, both testicles are involved. Even with involvement of both testicles, sterility is only a rare complication of orchitis. Additionally, mumps may affect the pancreas or, in females, the ovaries, causing pain and tenderness in parts of the abdomen. The mumps virus is contagious and spreads in tiny drops of fluid from the mouth and nose of someone who is infected. It can be passed to others through sneezing, coughing, or even laughing. The virus can also spread to other people through direct contact, such as picking up tissues or using drinking glasses that have been used by the infected person. People who have mumps are most contagious from 2 days before symptoms begin to 6 days after they end. The virus can also spread from people who are infected but have no symptoms. Mumps can be prevented by vaccination. The vaccine can be given alone or as part of the measles-mumps-rubella (MMR) immunization, which is usually given to children at 12 to 15 months of age. A second dose of MMR is generally given at 4 to 6 years of age. As is the case with all immunization schedules, there are important exceptions and special circumstances. If they haven't already received them, students who are attending colleges and other post-high school institutions should be sure they have had two doses of the MMR vaccine. During a measles outbreak, your doctor may recommend additional shots of the vaccine, if your child is 1 to 4 years old. Your doctor will have the most current information. The incubation period for mumps can be 12 to 25 days, but the average is 16 to 18 days. Children usually recover from mumps in about 10 to 12 days. It takes about 1 week for the swelling to disappear in each parotid gland, but both glands don't usually swell at the same time. If you think that your child has mumps, call your doctor, who can confirm the diagnosis and work with you to monitor your child and watch for complications. The doctor can also notify the health authorities who keep track of childhood immunization programs and mumps outbreaks. At home, monitor and keep track of your child's temperature. You can use non-aspirin fever medications such as acetaminophen or ibuprofen to bring down a fever. These medicines will also help relieve pain in the swollen parotid glands. Unless instructed by the doctor, aspirin should not be used in children with viral illnesses because its use in such cases has been associated with the development of Reye Syndrome, which can lead to liver failure and death. You can also soothe the swollen parotid glands with either warm or cold packs. Serve a soft, bland diet that does not require a lot of chewing and encourage your child to drink plenty of fluids. Avoid serving tart or acidic fruit juices (like orange juice, grapefruit juice, or lemonade) that make parotid pain worse. Water, decaffeinated soft drinks, and tea are better tolerated. When mumps involves the testicles, the doctor may prescribe stronger medications for pain and swelling and provide instructions on how to apply warm or cool packs to soothe the area and how to provide extra support for the testicles. A child with mumps doesn't need to stay in bed, but may play quietly. Ask your doctor about the best time for your child to return to school. Call the doctor if you suspect that your child has mumps. If your child has been diagnosed with mumps, keep track of his or her temperature and call the doctor if goes above 101° Fahrenheit (38.3° Celsius). Because mumps can also involve the brain and its membranes, call the doctor immediately if your child has any of the following: stiff neck, convulsions (seizures), extreme drowsiness, severe headache, or changes of consciousness. Watch for abdominal pain that can mean involvement of the pancreas, or involvement of the ovaries in girls. In boys, watch for high fever with pain and swelling of the testicles.